One of my favorite parts of the holidays is seeing the outpouring of volunteers and donations to those in need. It makes me even more excited to see large companies giving back to the community. In the spirit of the holidays, Jane Cosmetics is giving the gift of confidence and care by inviting customers to join the efforts in making a difference. 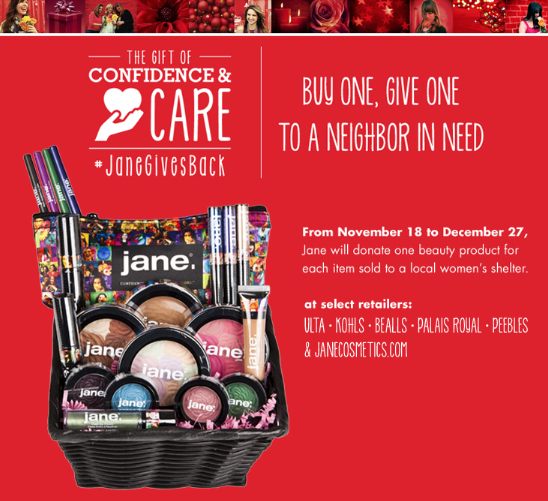 Beginning 11/18 - 12/27, Jane Cosmetics will donate one beauty product to charity for each and every product sold at www.janecosmetics.com and online & in-store at participating Kohl's, ULTA Beauty, Bealls, Palais Royal and Peebles stores. Be sure to follow the #JaneGivesBack campaign on Twitter, Instagram, YouTube and Facebook to learn more about CEO Lynn Tilton's passion for the leading cause behind this campaign. In what ways are you giving back this holiday season? Now I feel bad because I keep on getting and not giving enough...back to the drawing board. This is AWESOME!!!! No need to feel bad at all sis! I love the concept they came up with! I'm going to start doing more myself! Isn't it? I love to see companies doing things like this!